The UK’s leading short break provider has received recognition from two industry standard organisations for continuing to deliver excellent service to its guests. All five Center Parcs villages have retained their five star status from Quality in Tourism (previously Visit England), whilst the company also maintained its Hospitality Assured Premier position. Quality in Tourism is the official assessment service provided for VisitEngland. The regulatory body recognises quality, differentiates facilities and makes guests aware of what they can expect before they make a booking. Center Parcs achieved an average score of 92%, giving an exceptional result. The Quality in Tourism assessors commented on the high standards of presentation and service throughout and also praised the number of new initiatives and investments made by the business. This acknowledges Center Parcs’ commitment to continually reinvest and keep villages at a high standard, as well as introducing new activities and development projects. Hospitality Assured is the industry standard which recognises exceptional service and guest care for customer facing businesses. The assessment covered all aspects of Center Parcs: from accommodation, shops, restaurants and leisure activities, to corporate events and Head Office operations. Following visits to Whinfell Forest in Cumbria and Head Office in Nottinghamshire, Center Parcs achieved an impressive score of 81.1%, with assessors commenting ‘this truly world class score is an increase of 3.3% over the 2014 score’, reflecting the unparalleled levels of customer service. As the leader in the UK short break holiday market, Center Parcs regularly achieves average annual occupancy in excess of 97%. The Center Parcs concept is to provide a range of high quality accommodation, shops, restaurants and exceptional leisure facilities, carefully nestled amongst 400 acres of protected forest environment. This concept originated in Holland in 1967, with the first UK Center Parcs opening in 1987. Center Parcs is now a separate entity in the UK. Center Parcs has been announced ‘Best Family Holiday Provider’ in the Tommy’s Awards for the eleventh year in a row. 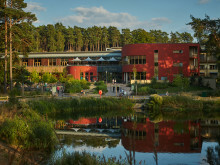 Woburn Forest has been awarded the Center Parcs Village of Excellence award. 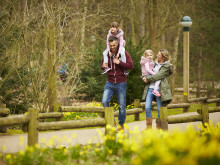 Center Parcs has won two publicly voted-for awards recognising them as the top UK destination for family short breaks.